These high quality Chinese Lanterns contain a fuel cell providing heat for 20 minutes of flight. Simply open the lantern, light the fuel cell and wait until the paper balloon fills with hot air, release into the sky and watch as it floats away gently into the distance. Chinese lanterns are fully customisable, you can write on or colour the paper lantern to carry your personal message or artwork. Send your Chinese Flying Lantern soaring to celebrate Weddings, Birthdays, Anniversaries, Halloween, Bonfire Night, Diwali or any other special event. It will fly for up to 20 minutes and can rise over a mile in the sky - where it will still be visible all around! Many Chinese lanterns have been reported as UFO sightings, considering that not many people know about these fabulous lanterns, so when seen they are genuinely an unidentified flying object. Traditionally used in Chinese,Thai and far eastern celebrations, Chinese Flying Lanterns are a beautiful and fascinating way to light up the sky that’s becoming increasingly popular throughout the world. Flying Lanterns are traditionally known as ‘Khom Fay’ or ‘Khom Loy’ in China and have been used for nearly two thousand years. 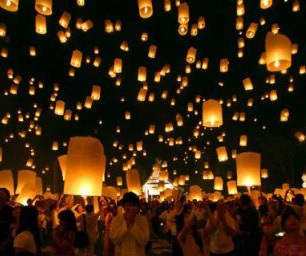 It was believed that wishes written on lanterns would rise up to the heavens and come true. 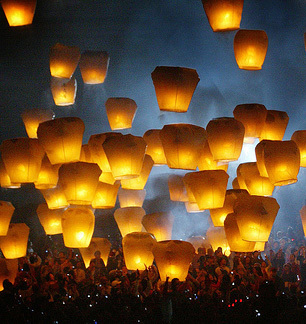 The Chinese Lantern is made from flame-retardant rice paper which is a 100% bio-degradable material. A quieter, gentler alternative to fireworks, flying lanterns are the safe, simple and perfect way to create an amazing visual display in the sky! Our Chinese flying lanterns are very simple to set up, just follow the easy instructions on the back of the pack and you'll have your personal Chinese lantern flying and impressing all who witness the event. Whilst they look phenominal, Chinese Flying Lanterns are only for adult use. * Not suitable for use by children under 16. * Never use near airports, under flight paths, near pylons or overhead cables. * Do not use near anything that may catch fire, such as dry crops or woodland.